Norwich City Football Club was founded in 1902 and is a proud, historic representative of Norfolk. A founding member of the Premier League, the club is instantly recognisable by its famous canary yellow jersey which its players have been sporting since 1907. The Club's vision is to be an established Premier League club, driven by its proud, passionate football community. This vision is supported by a new strategy focusing on the development of players, and a new structure and personnel have been put in place. The next critical phase is to invest into the physical Academy infrastructure at Colney Training Ground, to continue to compete at the highest level and attract and develop the best youth talent for today and for the future. The Canaries Bond will raise funds to invest in the development of the Academy facilities at Colney Training Ground. The 5-year fixed-term Bond has a target raise of £3,500,000, and a maximum of £5,000,000. Investors will receive 8% interest per annum, made up of 5% cash interest and 3% Club Credit to be spent on regular individual match tickets, hospitality, food & drink, merchandise and events. A one-off Promotion Bonus of 25% is payable if the club is promoted to the Premier League within the term of the Bond. Exclusive investor benefits include privileged access to Academy, Matchday Hospitality, and your name engraved on the Investors' Wall at the training ground. The vision for Norwich City is to become an established Premier League Club, driven by its proud, passionate football community. As the only professional football club in the county of Norfolk, the support and link between Club and local community is incredibly important. The Club’s new strategy places a major focus on the development of players, and a modern, dynamic structure has been put in place to enable that – replacing the model of a single CEO with the unique and complementary expertise of a Sporting Director and a Managing Director, and a Head Coach with a track record of bringing through young players. As one of only 24 EPPP Category 1 academies in England & Wales, we can recruit players from all over the country, and our teams compete against the very best in their age groups – the majority of the academies holding Category 1 status are Premier League clubs, so the level of competition is very high. Being a Category 1 Academy is extremely important to the ambitions of Norwich City, and this means satisfying the independent auditors on key areas of delivery, including: productivity rates, training facilities, coaching, education and welfare provisions. 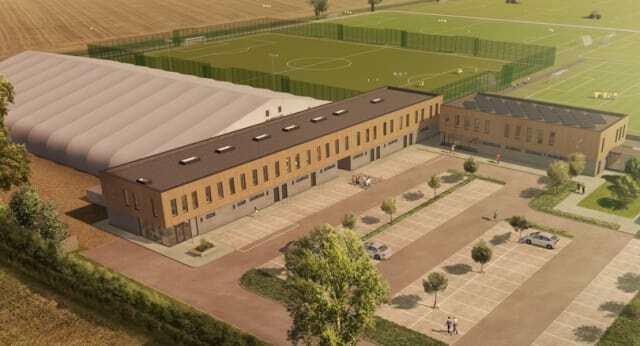 To help the Club deliver in these areas, ambitious plans have been drawn up to build state-of-the-art new facilities, to make the Club’s Academy the envy of the country, and construction has already begun on the first phase of this redevelopment, a new building to provide eight player changing rooms and two match official changing rooms. The Club wants to give the fans and other investors the opportunity to become long-term partners in developing the facility for the benefit of Norwich City’s future on and off the pitch; in short, to be involved in Building Our Future. In return for their investment, Bondholders will receive 8% interest per annum (5% cash interest + 3% Club Credit interest) in addition to truly unique investor privileges. Furthermore, to share in the Club’s future success, a one-off 25% bonus will be paid in the event of promotion to the Premier League. Want to know more? For more details on the Academy investment, and to find out what you could receive from investment in the Canaries Bond, simply click the Learn More & Invest button above to read on. What are the characteristics of a bond like the Canaries Bond? It is an innovative and effective way for an unlisted company to raise funds from a non-institutional audience (e.g. general public). Bonds like the Canaries Bond are typically issued at a fixed interest rate over a set period of time (e.g. 5 years). The investor is repaid through interest payments at regular intervals, until the maturity of the bond at which point the initial investment (principal) is repaid. Who is issuing the Canaries Bond? The Canaries Bond is issued by Norwich City Football Club plc, a public limited company incorporated in England and Wales with registered number 00154044 and with its registered office at Carrow Road, Norwich, NR1 1JE. Who can invest in the Canaries Bond? Any individual of at least 18 years of age or a company or charity that satisfies the conditions of Application and completes the Appropriateness Questionnaire can invest in the Canaries Bonds. Investors must be resident in the United Kingdom or a country where you may legally receive financial promotions of the nature provided by Tifosy and are legally entitled to invest in the type of investments offered. Tifosy does not advertise investment opportunities to people in the United States, Canada, Australia, Japan or any other country where it would be unlawful for our capital raises to be advertised. Investors must not register or view details or key documentation if they are resident in these countries. How many Canaries Bonds can I apply for? The minimum amount of Canaries Bonds for which you can apply is £500. You can, subject to availability, apply for as many Canaries Bonds as you wish, in increments of £500. Can companies invest in the Canaries Bond? The target is to raise £3,500,000 by the issue of the Canaries Bond. The Canaries Bond may be issued when the minimum investment threshold of £2,000,000 has been reached. In order to satisfy demand, up to £5,000,000 of Canaries Bonds in total may be issued. Should the minimum threshold of £2,000,000 not be reached, the Canaries Bond will not be issued, and monies will be returned to investors. What happens if the £3,500,000 target is not reached? Should the minimum threshold of £2,000,000 be reached but funds fall short of the target of £3,500,000, the Club will issue the Canaries Bond, and will look into further funding options to cover the shortfall. The Club has undertaken to continue with the planned developments regardless of the outcome of the Bond issuance. The Canaries Bonds will yield a fixed return on your initial investment of 8% (gross) per annum comprised of 5% in cash and 3% in Club Credit. Interest is paid annually. In the event that the Club is promoted to the Premier League you will also be paid a one-off promotion bonus of 25% (gross) on your initial investment. The Canaries Bonds will pay a one-off promotion bonus of 25% in the event that the Club is promoted to the Premier League during the term of the Canaries Bond. This bonus will be paid by the Company on September 30 following promotion. The Promotion Bonus will only be paid a maximum of one time. If the Canaries Bond has been redeemed or the Club is not promoted during the term of the Canaries Bond the Promotion Bonus will be not be paid. If you are a private investor then all interest (both cash interest and club credit interest) and potential bonus paid on the Bonds is subject to withholding tax at 20%. This amount will be withheld by the Company at source and paid to HMRC on your behalf. Investments made through a UK corporate may be paid interest gross and should be accounted for by such corporate as part of its corporation tax return. It is your responsibility to report the interest on your tax return as appropriate and pay or reclaim any tax that may be due. Can I pay by instalments or top up my holding of Canaries Bonds? No, unfortunately you will not be able to pay for your Canaries Bonds in instalments, nor can they be topped up. All Applications must be accompanied by an online payment or bank transfer for the full amount of Canaries Bonds applied for. The Company is unable to accept Applications that are not accompanied by payment for the full amount of Canaries Bonds applied for. The application period will be open until 23:59 (UK time) on Friday 25th May. However, if the demand is very high and applications for the full amount of bonds issued come before that date, the application period may close early. Yes, there is a cooling-off period of 14 days, which begins on the date your completed Application has been received. You have the option to cancel your investment within this period by emailing canaries@tifosy.com, in which case your money will be returned and no interest will be payable. After 14 days, your Application will be irrevocable and will not be capable of being terminated or rescinded by you. Are the Canaries Bonds transferable? No, the Canaries Bonds are not transferable and they cannot be sold or traded. The interest coupon and redemption of principal are payable to the original Bondholder. What if I can't pay £500, or don’t want to invest in the bond, but still want to support the Academy? The minimum investment amount for a bond to be cost-effective is £500. Sums below £500 to support the Academy development can be donated to the Club directly. If donating under £500, donors will not receive a Canaries Bond or any interest return. The Club will be announcing details of other ways supporters can support the project over the coming weeks. You should read the documentation in full, including the Invitation Document, the Bond Instrument document, and the Q&A document, and make sure you fully understand the risks involved. Click "Invest Now" to submit an application through the Norwich City FC campaign page on the Tifosy platform. Do I need to discuss an investment in Canaries Bonds with a financial advisor? You are strongly recommended to seek the advice of an independent financial advisor. Drop-in sessions at Carrow Road Stadium, from 10.30am to 3.30pm on Weds 4th April, Thurs 19th April, Fri 27th April and Tues 8th May. Just come to stadium reception. Call +44 (0)20 7349 0622 between 9am and 5pm. Email canaries@tifosy.com to ask any question, or to request a call back. Use the Live Chat box on the investment page between 9am and 5pm. Tifosy has secure systems in place to safeguard financial information. Tifosy will only use your financial information in order to facilitate interest payments or repayment of principal. No other third party will have access to this information.